The Lowth Entrepreneurship Center on the eighth floor of the Innovation and Collaboration Building (ICB) is not just for business students, and administrators want more students to use the space. When asked by The Minaret about the features of the Lowth Entrepreneurship Center, few knew what all it contained. “I’ve heard it’s good for business majors who want to give presentations. That’s literally all I know,” said Logan Blascovich, a junior marine science-biology major. Jon Roitman, a freshman finance major, said he thought that only entrepreneurship majors and minors were allowed in the center. Lowth Entrepreneurship Center Assistant Director Dean Koutroumanis has heard the rumors and misinformation many times around campus, or even while riding the elevator in the ICB building. The entrepreneurship center opened in September 2015 and was designed to house a “living, learning laboratory” where students can work on, and hopefully launch, their business ideas while collaborating with other like-minded students and staff, Koutroumanis said. It seems the rumors about the entrepreneurship center started soon after its opening when students were asked to leave, or turned away at the front desk, when they attempted to use the space to work on homework and group projects. 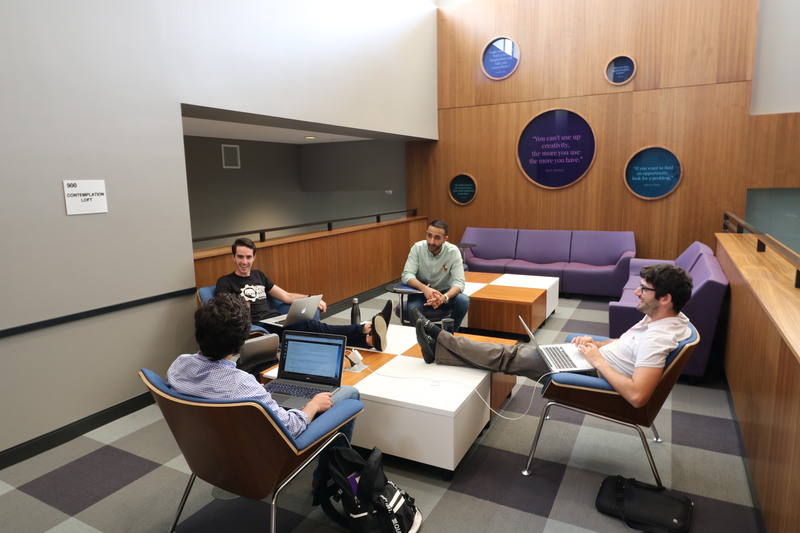 “[Students] will get turned away for sitting up here and doing homework,” said Matt Phillips, a senior entrepreneurship major who utilizes the center to work on his business, LiftSync. Instead, the center is for any student, no matter their major or year, who has a business idea and is dedicated to getting it started. It also houses several programs designed to aid students in their entrepreneurship goals, such as the Collegiate Entrepreneurs’ Organization (CEO, or “the entrepreneurship club”), the Spartan Accelerator and Incubator program and C.R.E.A.T.E., a competition designed to hone students’ skills in pitching ideas while vying for prize money. “Our overall goal is to provide a place for the community of UT entrepreneurs to collaborate to create and develop new business, technologies and innovations of all sorts,” said Lowth Entrepreneurship Center Director Rebecca White. In addition to having a designated space, the center offers many more resources budding entrepreneurs may find invaluable. There is a library with select books and an assortment of business document examples including business plans; there are projectors, white boards, meeting spaces and a cleverly designed technological system for presentations; and there are even two 3D printers where prototypes can be created. There are intangible benefits, too. While in the center, students will be able to network with each other, allowing for collaboration ideas, help from more experienced entrepreneurs, or even new business partners. Staff is always on hand to help mentor and coach students through issues or to provide needed information or business connections. Those connections can be vital to any company’s success. Students in the entrepreneurship center are introduced to business professionals, industry leaders, and financial institutions. “If you have a product you’re trying to get on shelves, what could be more valuable than asking the CEO how to do it?” White said. And those connections pay off. One company started in the UT Accelerator program, Signature Lacrosse, had a $1.2 million purchase while still operating out of the center. For anyone interested, there are several ways to get involved. There is an online application for the Spartan Accelerator and Incubator program. Students can also send an email to any of the center’s staff; there is a weekly lunch in the center kitchen on Monday’s from 11:30 -1 p.m. (bring your own lunch); or students can simply go to the eighth floor of the ICB and inquire at reception. Be prepared for the Accelerator and Incubator application – some students say it’s hefty and can take some time. That’s not surprising considering the administration’s dedication to let only students who are dedicated and motivated participate in the program. Nathan Gardner can be reached at nathan.gardner@spartans.ut.edu.